Add up to 11 ports, 7 high speed data transfer ports for external devices and 4 smart charging ports for phone, ipad, ps4 etc. Especially great for notebooks which come with only a few ports in an era when you need to attach many USB devices at once, such as a printer, card reader, cell phone, iPod, thumb drive, mouse, keyboard, or an external hard drive. Achieve full 5 Gbps on each port. Four extra dedicated charging ports dynamically recognizes and provides the fast charging mechanism (up to 2.4A) for your USB devices. * Add up to 11 devices by daisy-chaining multiple hubs (7 USB data ports + 4 charging ports). * 11-Port USB 3.0 hub. ❤ It comes 12V 4A power adapter, please only use the original power adapter. ❤ Ensure that the adapter is connected with HUB before using. ❤ DO NOT make the total of current over 4A when charging your multiple devices, which may damage HUB and external devices. ❤ DO NOT connect the HUB with self-assembly devices. ❤ When the HUB needs to be connected to a desktop computer, we recommended to connect it with the motherboard port which is on the back of desktop computer. ❤ Some USB 3.0 devices and 2.4G wireless devices (wireless mice, wireless keyboard etc.) may not be supported, please use the host port or a USB 2.0 connection. This product comes with one year manufacture warranty. MULTI USB PORT EXPANDER & LONG CORD: There are 7 USB Data Transfer Ports, which makes it very easy to connect Multi USB devices to your PC, laptop simultaneously, such as keyboard, mouse, card reader, mobile HDD, webcam, mp3 players, oculus, etc. And this USB hub is coming with 100cm Built-in cord, enough length for you to arrange your cables. UP to 4 FAST CHARGING PORTS: This USB expansion hub with 4 fast charging ports allows to charge cellphones, tablets, cameras, speakers and more. The most important thing is that it could automatically detect your device's charging protocols to deliver the optimum charge at speeds up to 2.4 amps per port. CHARGE FASTER. 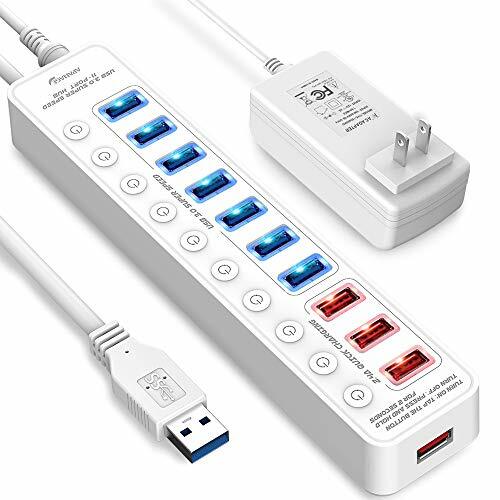 INDIVIDUAL ON/OFF SWITCHES: As a powerful USB splitter and gadget manager, this 11-port USB hub has built-in on and off switches with led indicators for each port, being able to turn on or off the separate USB port without unplugging the equipment, blue LED lights let you know the working status easily, each switch remembers the on/off config. 5Gbps HIGH SPEED DATA TRANSFER: The USB 3.0 Hub extension provides up to 5 Gbps data speed, which means you will transfer an HD movie in seconds, and it is backwards compatible with USB 2.0/1.1. Every port supports Hot Plug. WIDE COMPATIBILITY: This powered USB Hub is compatible with the most operating systems: Windows XP/Vista/7/8/10; MacOS-8/9/X, UNIX, Linux and offers fast PLUG-AND-PLAY installation. If you have any questions about this product by APANAGE, contact us by completing and submitting the form below. If you are looking for a specif part number, please include it with your message.